Assoc. Prof. Dr. Sagol Jariyavidhyanond, seated 3rd left, Chairman of St Theresa International College Council graciously presided over the Council Members Meeting No. 3/2013 on September 12, 2013 at Maria Theresa Meeting Room. Assoc. Prof. Dr. Sagol gained invaluable extensive work experience as Dean of Faculty of Social Development, Director of Research Affairs Office, Director of Graduate Studies Development Office, Vice President for Academic Affairs as well as Dean of Social Development and Environment, National Institute of Development Administration (NIDA). He is also a member of the Rajabhat University of Nakhonsi Thammarat Academic Council. 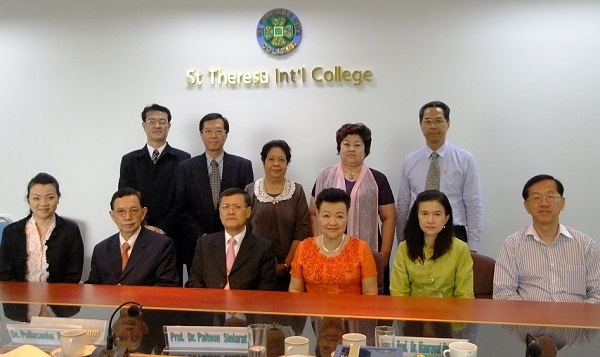 With the Council Chairman, seated from left, are Dr. Piyada Wattanasan, the President of St Theresa International College, Prof. Dr. Paitoon Sinlarat, Vice President for Research of Thurakit Bandhit University, Assoc. Prof. Dr. Sagol, Dr. Theresa Virachanee Phromsuntorn, the Managing Director of St. Theresa Professional Development Co., Ltd., and the Vice Chairwoman of STIC Council, Assoc. Prof. Dr. Manyat Ruchiwit, the Director of East Asia Studies Institute, Thammasat University, Rangsit Campus Center, Mr. Tan Yew Sing, the Project Manager of Rurban Properties SDN BHD in 1983 and Managing Director of Mandaria SDN BHD in 1985. He was a Group President of Inti College, Malaysia in 1986 and Group CEO of Inti Universal Holdings BERHAD in 1996.